Are There Foods That Help Prevent Alzheimer's Disease? Like the rest of the body, the brain also needs a healthy and nutritious diet to operate at its best potential. One must focus on consuming a lot of fresh fruits, vegetables, proteins, healthy fats and whole grains. Alzheimer’s disease affects the brain such that the memory and thinking skills of the individual slowly decline. It is a progressive mental deterioration disorder that can occur during one’s middle age or old age. The cause of the disease is due to generalized degeneration of the brain. Alzheimer’s disease is a very common cause of premature senility. For more than a decade or so, it was thought that Alzheimer’s disease did not have a medical cure and that could it be prevented. But, the truth is that this illness can be prevented with the help of a right diet, correct exercises, and following a healthy lifestyle. Like the rest of the body, the brain also needs a healthy and nutritious diet to operate at its best potential. One must focus on consuming a lot of fresh fruits, vegetables, proteins, healthy fats and whole grains. Eating habits that lower the inflammation and provide a strong supply of energy to the body are recommended. A Mediterranean diet that is rich in fish, nuts, whole grains, olive oil, vegetables and fruits are healthy for the heart. Taub Institute for Research in Alzheimer's disease and the Aging Brain in a study has quoted that people who consume Mediterranean diet regularly for a longer period of time are associated with a reduced risk for Alzheimer’s disease. By reducing the consumption of full-fat dairy products, red meats, fast foods, fried foods, fired foods, and other packaged food items. These contain a lot of saturated fats that needs to be avoided on a daily basis. According to a study cited in Alzheimer's Society people who consume a higher quantity of saturated fats had double the chance of developing Alzheimer’s disease, as against those who ate much less saturated fats. The foods that are healthy for the heart make the brain more active. 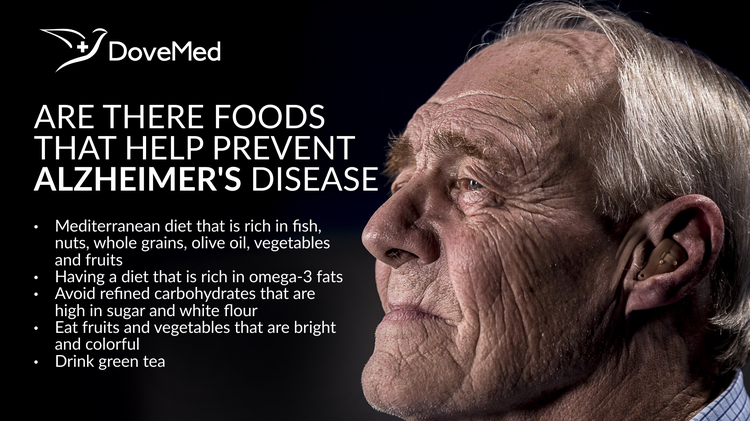 So, one can lower the risk of Alzheimer’s disease by having a diet that is rich in omega-3 fats. Food sources that include cold-water fish like salmon, tuna, mackerel, trout and sardines, are rich in omega-3 fats. According to a research quoted in the JAMA, omega-3 fats are a potential treatment for Alzheimer’s disease. One must avoid refined carbohydrates that are high in sugar and white flour, as it ignites the glucose levels and inflames the brain. Making the plate colorful helps in fighting against Alzheimer’s. Fruits and vegetables that are bright and colorful provide a lot of antioxidants and are rich in vitamins. When an individual consumes daily servings of berries and green leafy vegetables, it helps to protect the brain in the long run. Consumption of green tea on a daily basis is a best-suited preventative measure against Alzheimer’s. This enhances the memory power and increases mental alertness, while slowing down the aging of the brain. The most important factor for preventing Alzheimer’s relates to a healthy diet and a lifestyle that includes exercise on a daily basis, or thrice a week. Also, it is important that one consumes food at regular intervals in smaller quantities, rather than a large meal at a time, in order to maintain proper blood sugar levels. Sofi, F., Macchi, C., Abbate, R., Gensini, G. F., & Casini, A. (2010). Effectiveness of the Mediterranean diet: can it help delay or prevent Alzheimer's disease?. Journal of Alzheimer's Disease, 20(3), 795-801. Kamphuis, P. J., & Scheltens, P. (2010). Can nutrients prevent or delay onset of Alzheimer's disease?. Journal of Alzheimer's Disease, 20(3), 765-775. Pope, S. K., Shue, V. M., & Beck, C. (2003). Will a healthy lifestyle help prevent Alzheimer's disease?. Annual review of public health, 24(1), 111-132. Hartman, R. E., Shah, A., Fagan, A. M., Schwetye, K. E., Parsadanian, M., Schulman, R. N., ... & Holtzman, D. M. (2006). Pomegranate juice decreases amyloid load and improves behavior in a mouse model of Alzheimer's disease. Neurobiology of disease, 24(3), 506-515. Engelhart, M. J., Geerlings, M. I., Ruitenberg, A., van Swieten, J. C., Hofman, A., Witteman, J. C., & Breteler, M. M. (2002). Dietary intake of antioxidants and risk of Alzheimer disease. Jama, 287(24), 3223-3229. Pasinetti, G. M., Wang, J., Ho, L., Zhao, W., & Dubner, L. (2015). Roles of resveratrol and other grape-derived polyphenols in Alzheimer's disease prevention and treatment. Biochimica et Biophysica Acta (BBA)-Molecular Basis of Disease, 1852(6), 1202-1208. Thaipisuttikul, P., & Galvin, J. E. (2012). Use of medical foods and nutritional approaches in the treatment of Alzheimer’s disease. Clinical practice (London, England), 9(2), 199. Gu, Y., Nieves, J. W., Stern, Y., Luchsinger, J. A., & Scarmeas, N. (2010). Food combination and Alzheimer disease risk: a protective diet. Archives of neurology, 67(6), 699-706.